Sustainable Development in Practice: Case Studies for Engineers and Scientists, Second Edition explores the concept of sustainable development and its implications for science and engineering. It looks at how sustainability criteria can be combined with traditional scientific and engineering considerations to design and operate industrial systems in a more sustainable manner. Taking a life cycle approach to addressing economic, environmental and social issues, the book presents a series of new practical case studies drawn from a range of sectors, including mining, energy, food, buildings, transport, waste, and health. Written in an accessible style, the book opens with a general introduction to the concept of sustainable development and explores its practical implications for technical experts. Recognising that practical application of sustainable development depends on the context, the second part of the book is devoted to case studies. The case studies explore scientific and technical aspects alongside relevant environmental economic and social issues. Twelve new chapters, including the case studies on nuclear energy, biofuels, aviation, buildings, urban transport, food, sanitation and health. 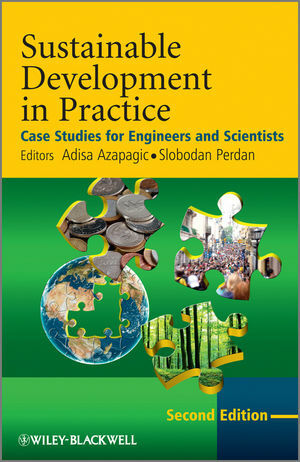 Considered essential reading for all engineers and scientists concerned with sustainable development, Sustainable Development in Practice: Case Studies for Engineers and Scientists, Second Edition also provides key reading and learning materials for undergraduate and postgraduate science and engineering students. Adisa Azapagic is Professor of Sustainable Engineering. Her research interests and expertise include life cycle modeling and optimization, life cycle assessment, industrial ecology, sustainability indicators, multiple criteria decision analysis and corporate social responsibility. Azapagic is the author of over 130 publications in these areas, including a book on Polymers, the Environment and Sustainable Development also published by Wiley. She is also interested in sustainability education and is a member of the European Federation of Chemical engineering (EFCE) Working Party on Education. She is a UNESCO/TWAIS/ICSU Visiting Scientist at the Instituto Technológico Autónomo de México (ITAM), Mexico City. Slobodan Perdan is a philosopher with expertise and professional interests in the areas of sustainable development, moral philosophy and sustainability education. He has written on a variety of issues concerning sustainable development, and has taught and researched a wide range of subjects including environmental philosophy, business and engineering ethics, corporate sustainability and social and political theory. Perdan is currently working as a freelance consultant having previously worked at the University of Surrey for several years.